The current 1/35 iteration (albeit flawed) of the US Army's M109A6 Paladin self propelled gun is Italeri’s 2007 issue (#372), complete with tracks that are inflexible and incorrect for the vehicle. Until recently, only Skybow/AFV Club offered an aftermarket solution to the tracks on the Paladin, using older T-136 tracks; this track/pad combination had been used on older M109A2s and M992s. 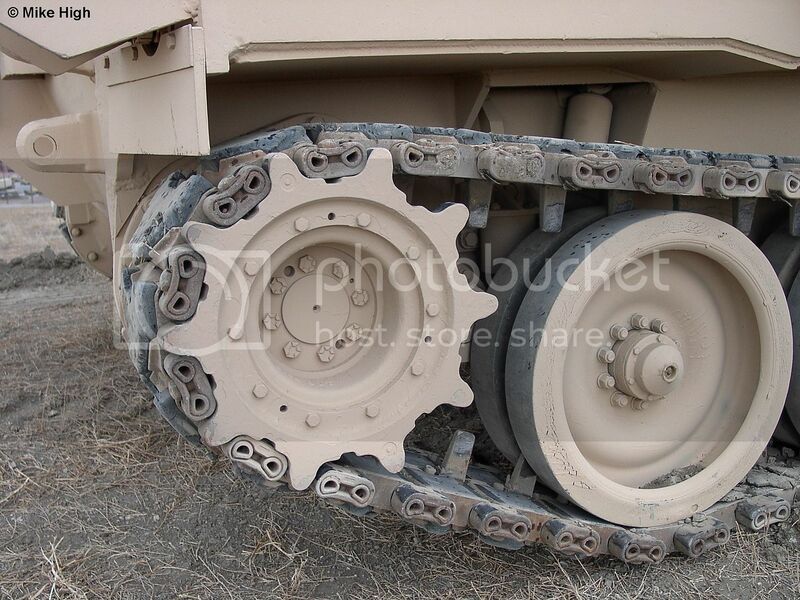 They are the correct T-154 tracks used on the M109A6, but are a close substitute. Skunk Models Workshop has released a set of T-154 “crawler” tracks in injection molded plastic and at a very reasonable price. The tracks are packaged in a side entry box, with a nice tri-view of the M109A6 on one half of the box and CGI renderings of the kit parts (and a stylized “instruction view” as well) on the other half. The tracks are packaged in two separate bags, each containing 5 sprues with 18 individual track links, 36 end connectors and a single “link and length” track section with 22 links, but with each end link open for an end connector. Presumably this is to help a static model by using these as the bottom run, and possibly the top run after the small amount of track sag has leveled out. The end connectors have a pair of sprue connection points, and every single connector I took from the sprue needed clean up from the sprue points and some flash on each face of the connector. With 79 links suggested per side for the M109A6, this could be a VERY long and tedious process. I suggest some good music and a tall refreshment beside you before undertaking the cleanup. I have included some comparison shots in the gallery with the AFV Club tracks, which I happened to have already with the Italeri kit. While not correct, they do seem to provide a better overall appearance over the drive sprocket and have a better “sit” along the road wheels. Also, the AFV Club tracks are workable, as the end connectors for the track links “press fit” into the links quite tightly. Again, not a comparison review, but help for those out there looking for alternatives to the kit “tracks”. The front and rear covers of the package provide the necessary “instructions”. Take a track link, clean it up, take another track link and clean it up, clean up two end connectors, and attach. I used Testor’s liquid cement in the black container with the steel applicator tip and used as small a dot as I could. I then slid the end connector on and aligned the track section on a home made alignment jig made from two 6” pieces of Evergreen strip #321. It had enough height to form a good channel on the glass pane I use for making tracks. For the price, it’s hard to beat these individual track links. They are miles above the kit offerings, and are the correct version for the M109A6 Paladin. Based on the NSN (national stock number) for the track and pad, the measurements are very close to dead on accurate. The cleanup is a really big chore, and the small size could mean frustration for those not acclimated to individual track link assembly. Fortunately you get 180 links plus ten long single runs, so if you lose one or two (or ten) to the carpet monster you still have enough to complete your runs for the Italeri kit. Highs: Cost is low enough to buy two sets to practice with, plenty of extra links for “oops” moments. Lows: Clean up on every link is virtually unavoidable, small end connector cleanup can be frustrating for newer modelers with little experience. Verdict: A good set of correct tracks for the Italeri M109A6 Paladin at a reasonable cost; recommended, with reservations as stated above. Our Thanks to Skunk Models Workshop! Link not working. This review either does not exist or has not been published for public viewing. Please contact us if you think you believe this is in error. All working... Excellent review Matt, thanks! I'm with Jim. AFV Club's tracks are much better detailed. @Jim and Gino I agree with the both of you. The AFV Club T-136s have a great deal more detail, have less cleanup and fit the Italeri drive sprockets better than the SMW. If you're on a really tight budget and HAVE to replace the horrific kit tracks, these are a good second option. I'm waiting to see if the Riich T-154s are a knock off of these, but I haven't found them. Also waiting to see if the Riich Models M109A6 ever comes to light as well. Cheers fellas! I don't know about that. From what I can tell, they actually sell for about the same price. Both are about $15 including shipping from Lucky Model. Wow, those are both pretty close in price. I don't know why I thought the AFV Club tracks were so expensive. Might have been when I got them, or I'm just slowly going senile.